Boom 11 m - 42 m, five-section, sequence synchronized, full-power boom with A and B mode. Maximum tip height: 44,6 m. Boom nose: four nylatron sheaves mounted on heavy-duty tapered roller bearings with removable pin-type rope guards. Quick-reeve type boom nose. *Fixed swingaway extension 10,1 m offsettable lattice swingaway extension. Offsetable 0°, 25° and 45°. Stows alongside base boom section. Maximum tip height: 54,0 m.
*Bifold swingaway extension 10,1 m - 17,1 m bifold lattice swingaway extension. Offsetable at 0°, 25° and 45°. Stows alongside base boom section. Maximum tip height: 61,1 m.
*Inserts 6,1 m lattice extension inserts. Installs between the boom nose and bifold extension, non-stowable. Maximum tip height: 73,6 m.
Boom elevation One double-acting hydraulic cylinder with integral holding valve provides elevation from -3° to +78°. Load moment and anti-two block system Standard "Graphic Display" load moment and anti-two block system with audio-visual warning and control lever lockout. These systems provide electronic display of boom angle, length, radius, tip height, relative load moment, maximum permissible load, load indication and warning of impending two-block condition. The standard Work Area Definition System allows the operator to pre-select and define safe working areas. If the crane approaches the pre-set limits, audio-visual warnings aid the operator in avoiding job-site obstructions. Cab Full-vision, all-steel fabricated with acoustical lining and tinted safety glass throughout. Deluxe seat incorporates armrest-mounted hydraulic single-axis controllers. Dash panel incorporates gauges for all engine functions. Other standard features include: hot water heater, cab circulating air fan, sliding side and rear windows, sliding skylight with electric wiper and sunscreen, electric windshield wash/wipe, fire extinguisher and seat belt, air conditioning. Slewing Planetary swing drive with foot applied multi-disc brake. Spring applied, hydraulically released swing brake and plunger-type, one position mechanical house lock, operated from cab. *Optional 360° mechanical swing lock. Maximum speed: 2,5 RPM. Counterweight 6 516 kg pinned to structure. Hydraulic system Three main pumps with a combined capacity of 511 LPM. Maximum operating pressure: 27,6 MPa. Two individual post pressure compensated valve banks. Return line type filter with full flow by-pass protection and service indicator. Replaceable cartridge with micron filtration rating of 5/12/16. 640 L hyd. reservoir. Integral oil cooler. System pressure test ports. Hoist Planetary reduction with automatic spring applied multi-disc wet brake. Grooved drum. Electronic hoist drum rotation indicators, and hoist drum cable followers. Maximum Single Line Pull: 8 363 kg. Maximum Permissible Line Pull: 7 620 kg with standard 6X37 class rope. 7 620 kg. with optional 35X7 class rope. Maximum Single Line Speed: 153 m/min. Rope Construction: 6X37 EIPS IWRC, *35x7 Flex-X, Rotation Resistant Rope Diameter: 19mm. 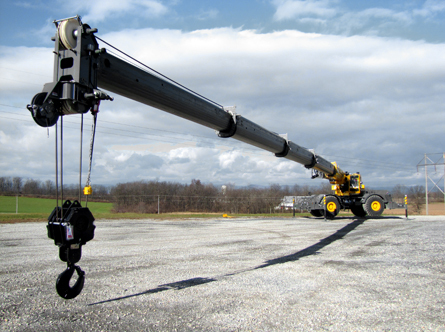 Rope Length: Main Hoist: 183 m - Optional: 152 m. Maximum Rope Stowage: 211 m.
Carrier frame Box section frame fabricated from high-strength, low alloy steel. Integral outrigger housings and front/rear towing, lifting and tie down lugs. Outriggers Four hydraulic telescoping single-stage double box beam outriggers with inverted jacks and integral holding valves. Three position setting, 0%, 50% and fully extended. All steel fabricated, quick release type outrigger floats, 610 mm diameter. Maximum outrigger pad load: 41 731 kg. Controls and crane level indicator located in cab. Transmission Spicer powershift with 6 forward and 6 reverse speeds. Front axle disconnect for 4 x 2 travel. Drive/Steer 4 x 4. Fully independent power steering: Front: Full hydraulic steering wheel controlled. Rear: Full hydraulic switch controlled. Provides infinite variations of 4 main steering modes: front only, rear only, crab and coordinated. Rear steer centered indicating light. 4 wheel turning radius: 7,1 m.
Axles Front: Drive/steer with differential and planetary reduction hubs rigid mounted to frame. Rear: Drive/steer with differential and planetary reduction hubs pivot mounted to frame. Automatic full hydraulic lockouts on rear axle permit 203 mm oscillation only with boom centered over the front. Tyres Std. 29,5 x 25 - 28 bias ply. Gradeability (theoretical) 75% (Based on 43 830 kg GVW) 29.5 x 25 tires, pumps engaged, 42,0 m boom, bi-fold extension, aux. hoist and cable, and 59 t hookblock. Brakes Full hydraulic split circuit operating on all wheels. Spring-applied, hydraulically released parking brake. Electrical system Two 12 V - maintenance free batteries. 12 V starting and lighting. Battery disconnect switch. * Optional equipment Auxiliary Hoist Package (includes model HP30A-19G auxiliary hoist with electronic hoist drum rotation indicator, hoist drum cable follower, 152 m of 19 mm 35 x 7 class wire rope, auxiliary single sheave boom nose.